Our Stump Cross Caverns Adventure Caving has got even better. Now its time to experience our Cave Camping Expedition. 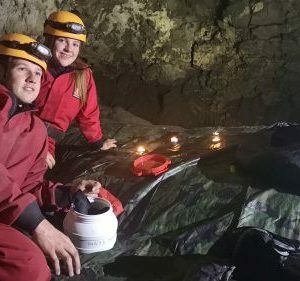 Go further into the system and spend the night underground, just as world record holder Geoff Workman did when he spent 105 days in Stump Cross Caverns – but with a few extra luxuries of course! All equipment, meals and camping supplies are included, as is FREE access to the visitor attraction at Stump Cross Caverns before we head off the beaten track on our Adventure Caving and Camping Expedition. Its nice and warm! Why camp outside when you can camp underground? There is no worry of creepy wildlife, you escape any typical British downpours – and you’ll never have the standard family argument when putting up a tent! Instead of that, after completing our Adventure Caving route, we head to Sand Cavern and set up camp. It’s a constant temperature around 10 Degrees C and all you will need is a sleeping mat, pillow & sleeping bag. Caves are a great place to sleep. They are natures own ready built bothies! You’ll be both proud and muddy when you finish this adventure. At 16.00 Meet your instructor at Stump Cross Caverns café – that’s HG3 5JL. Here we will pack our supplies and get our equipment ready. 16.30 Now its time to fuel up with some proper Yorkshire grub before we head underground, all homemade by Lisa, Nick and the team. 17.30 Let’s go Adventure Caving! We drop down the ‘Coal Chute’, crawl into the impressive ‘Clay Level’ and explore the giant passageways of the ‘Sand Cavern’ where caver Geoff Workman completed his renowned world record. 21.00 Set up our underground camp site and then eat some supper. After a good nights sleep we pack up camp and casually make our way to the surface where we have a Full English Breakfast waiting ready for the intrepid exploration party.